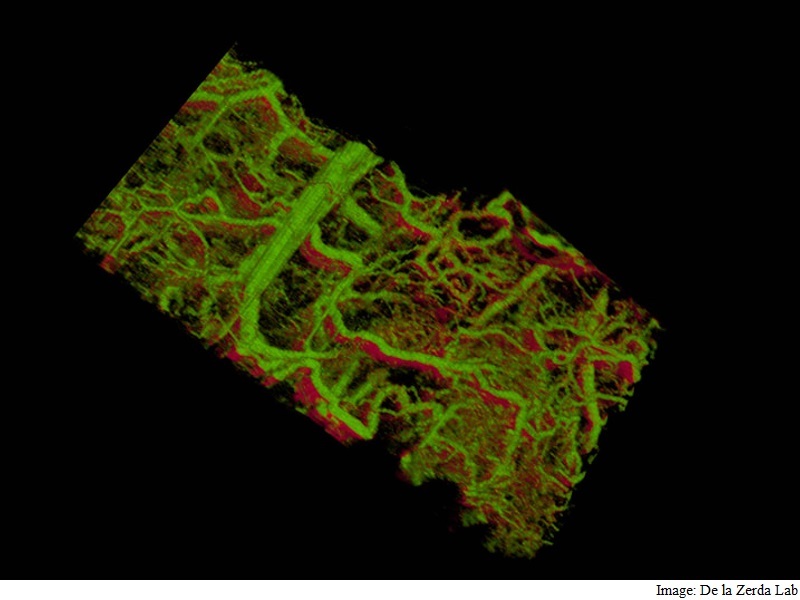 Scientists have developed a new technique that can create a 3D real-time image of individual cells or molecules under the skin of a living animal, showing intricate details of the lymph and blood vessels. The technique, called MOZART (for MOlecular imaging and characteriZation of tissue noninvasively At cellular ResoluTion), could one day allow scientists to detect tumours in the skin, colon or oesophagus, or even to see the abnormal blood vessels that appear in the earliest stages of macular degeneration – a leading cause of blindness. The technique could allow doctors to monitor how an otherwise invisible tumour under the skin is responding to treatment, or to understand how individual cells break free from a tumour and travel to distant sites, said Adam de la Zerda, an assistant professor at Stanford University. In other forms of microscopy, scientists have created tags that latch onto molecules or structures of interest to illuminate those structures and provide a detailed view of where they are in the cell or body. Tiny particles called gold nanorods are analogous to organ pipes, because longer pipes vibrate at lower frequencies, creating a deep, low sound, said Elliott SoRelle, graduate student at Stanford. Longer nanorods vibrate at lower frequencies of light. Those vibrations scatter the light, which the microscope detects. Researchers manufactured longer nanorods that were nontoxic, stable and very bright. To filter out the nanorods’ frequency from the surrounding tissue, they developed computer algorithms that could separate out the frequencies of light scattered by nanorods of various lengths and differentiate those from surrounding tissue. The resulting three-dimensional, high-resolution images were so big – on the order of gigapixels – that the team needed to develop additional algorithms for analysing and storing such large images. The team tested their technology in the ear of a living mouse, where they were able to watch as the nanorods were taken up into the lymph system and transported through a network of valves. They were able to distinguish between two different size nanorods that resonated at different wavelengths in separate lymph vessels, and they could distinguish between those two nanorods in the lymph system and the blood vessels. Having shown that the gold nanorods can be seen in living tissue, the next step is to show that those nanorods can bind to specific kinds of cells, like skin cancer or abnormal vessels in early stage macular degeneration. Then, the technique could be used to learn more about how those diseases progress at the molecular level and also evaluate treatments in individual patients, something that previously had not been possible.